A chalazion develops within the Meibomian glands of the eyelid, which are sebaceous glands that produce the tear film that lubricates the eyes. The eyelid has approximately 100 of these glands, located near the eyelashes. The condition is caused by obstruction of the duct that drains one of these glands. A chalazion begins as diffuse swelling and tenderness, and later forms a cyst-like localized swelling. 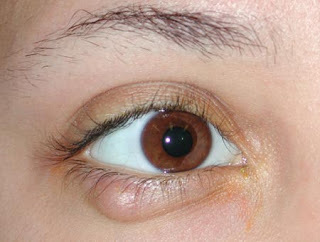 Examination of eyelid confirms the diagnosis. Rarely, the Meibomian gland duct may be blocked by a skin cancer. If this is suspected, a biopsy may be needed to diagnose the disorder. The primary treatment is application of warm compresses for 10 - 15 minutes at least 4 times a day. This may soften the hardened oils blocking the duct and promote drainage and healing. Dr.Senthil Kumar Treats many cases of Chalazions . In his Homeopathy medical professional experience with successful results. Many patients get relief after taking treatment from Dr.Senthil Kumar.